Nuclear and Radiological Engineering/Medical Physics; Radiation detection and shielding, neutron spectrometry and dosimetry, radiological assessment, radiation sources and applications, and computational dosimetry. Began at Tech in Winter 1993 as an Associate Professor. Prior was an Assistant and an Associate Professor at The University of Texas at Austin. Dr. Hertel performs research that integrates computational radiation transport with radiation measurements. He has made contributions in computational dosimetry, radiation detection, neutron spectroscopy, radiation dosimetry, radiological assessment, radiation shielding and radiation instrument modeling. Currently he is assessing the potential use of handheld radiation instruments, both spectrometers and counting instruments, to assess potential internal contamination of individuals who might be involved in a radiological dispersion device event. This work is carried out for the CDC Radiation Studies Branch by combining experimental testing of such instruments and extending the experimental results through simulations of the instruments with radioactivity dispersed in anthropomorphic phantoms. Dr. Hertel is the project manager of a DOE Nuclear Energy Research Initiative funded consortium of six universities who are collaborating with three national laboratories to design, construct, and use a time projection chamber to perform precision fission measurements. The chamber will be located on a neutron beamline at the Los Alamos Neutron Science Center (LANSCE) and used to make fission cross section measurements of actinides to support nuclear data needs for the next generation of reactors. Dr. Hertel is currently involved in research to measure the radioactive inventory of the mercury used in the target at the Spallation Neutron Source and compare the resultant activities to those predicted by the codes used to design high-energy facilities. This will hopefully lead to improved modeling of high-energy systems. In addition, Dr. Hertel continues to perform neutron spectral and dosimetry measurements in support of different nuclear facilities ranging from PET cyclotrons to spent fuel storage facilities to both research and power reactor facilities. As the coordinator of the Georgia Tech Focused Research Program on Pioneer Research in Nuclear Detection, Dr. Hertel has assimilated a multidisciplinary group of researchers on the Georgia Tech campus to address the nuclear detection needs for homeland security, nuclear nonproliferation verification and other related activities. His interest include the improvement of existing instruments, the fabrication of new detector materials and their testing, and the use of both passive and active interrogation to determine the presence of illicit special nuclear materials or radioactive materials. He also is pursuing interest in the personal dosimetry needs for active interrogation systems. Department of Energy U. S. Scientific Review Group of the Russian Health Studies Program Chairman, 2005-present. International Commission of Radiological Protection Committee (Task Group on Dose Calculation), 2002-present. R. Manger and N. Hertel. 2007. 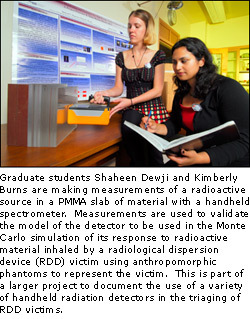 Use of a Geiger-Mueller Detector to Assess Internal Dose after a Radiological Dispersion Device. Transactions of the American Nuclear Society 97, 933-934. Rebecca M. Howell, et al. 2006. Calculation of Effective Dose from Measurements of Secondary Neutron Spectra and Scattered Photon Dose from Dynamic MLC IMRT for 6MV, 15MV, and 18MV Beam Energies. Medical Physics 33(2), 360-368. Z. Wang, N. E. Hertel, and A. Lennox. 2006 Fermilab Neutron Therapy Facility Neutron Spectrum Determination by Threshold Foils. Proceedings of Science(FNDA 2006) 041, http://pos.sissa.it. E. Burgett and N. E. Hertel. 2006. Plastic Scintillator Response Matrix for Spectral Unfolding of Gamma-Ray Energy. Transactions of the American Nuclear Society 95, 19-20. K. Kelley, et al. 2005. 148Gd Production Cross Section Measurements for 600- and 800-MeV Protons on Tantalum, Tungsten and Gold. Nuclear Physics A760, 225-233.